Our specialty is specializing to meet all your needs! Displaying over 300 diamond necklaces, 200 diamond bracelets, 500 pair of diamond earrings and an over abundance of semi-mounts, wedding bands and loose diamonds. We also specialize in "pre-owned" Rolex's and Cartier watches on display in our center showcase. 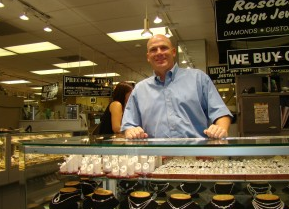 Our business at The International Jewelers Exchange has grown over the last 15 years to accommodate all your needs from birthdays to a ball.